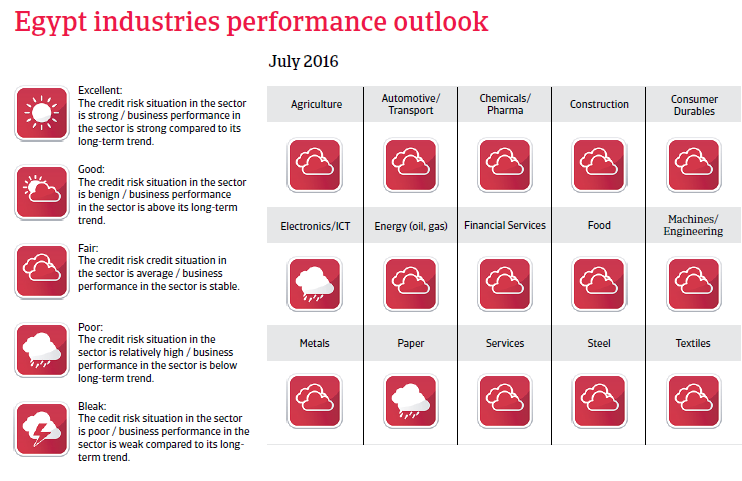 Weak economic situation and uncertain outlook as the security situation remains tense. Inflation is high and the business sentiment remains subdued. After the coup d'état of the Egyptian army against the Muslim Brotherhood government in July 2013, the political situation has stabilised again. But this stability came at the price of increased repression (curbed media freedom) and restrictions on demonstrations. Especially the Muslim Brotherhood movement has been suppressed and banned from the political process, with many leaders jailed. The internal security situation remains tense, as the military crackdown has pushed the Muslim Brotherhood underground, risking a further radicalisation of some elements. In the Sinai Peninsula and the border region to Libya Jihadist forces are stirring unrest. The largest of those groups is the so-called “Sinai Province”, an affiliate of the Islamic State. This group claimed responsibility for causing the crash of a Russian airliner in October 2015. In 2015 domestic security issues, especially the bombing of a Russian airliner in October, have had a very negative impact on tourism and the economy in general. This has increased the negative impact that political instability has had on tourism and foreign investments, the key sources of foreign exchange, over the past years resulting in a shortage of US dollars in the economy. 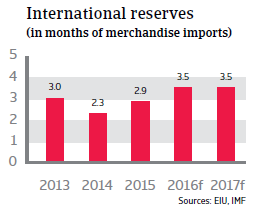 International reserves are low and the import cover is just around three months. As a consequence, investments are being withheld and some companies had to stop production due to lack of imported goods. 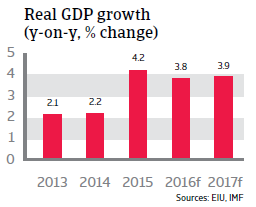 In 2016 economic growth is expected to decelerate to below 4%. Although a recent devaluation of the Egyptian pound by the Central Bank could ease the pressure on foreign reserves, US dollar shortages are expected to remain in the short term. This will have a negative impact on the business sentiment. The weaker currency will increase inflation which in 2016 is expected to rise to nearly 12%. In order to contain the inflation increase, the Central Bank raised the interest rate to 11.25% in early 2016. Other vulnerabilities are the weak government finances and the high external financing requirement. The budget deficit remains high and public debt amounts to more than 90% of GDP. 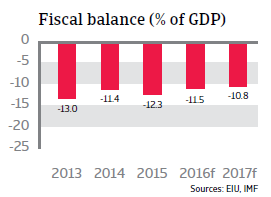 The budget deficit is expected to decrease only gradually in the coming years. It will be politically difficult to implement additional measures to sharply reduce the deficit, especially to cut spending on social projects, as a large part of public spending is still geared towards maintaining social stability. Local banks´ high level of exposure on the sovereign is a risk for the financial sector. The external financing requirement remains high (2016: more than 120% of reserves), mainly due to the high current account deficit caused by lower tourism revenues and exports. Currently Gulf countries like Kuwait, Saudi Arabia and the United Arab Emirates are Egypt´s main financial supporters, but the country will increasingly need more help, as financial support from the Gulf could decline due to lower oil revenues in those countries. 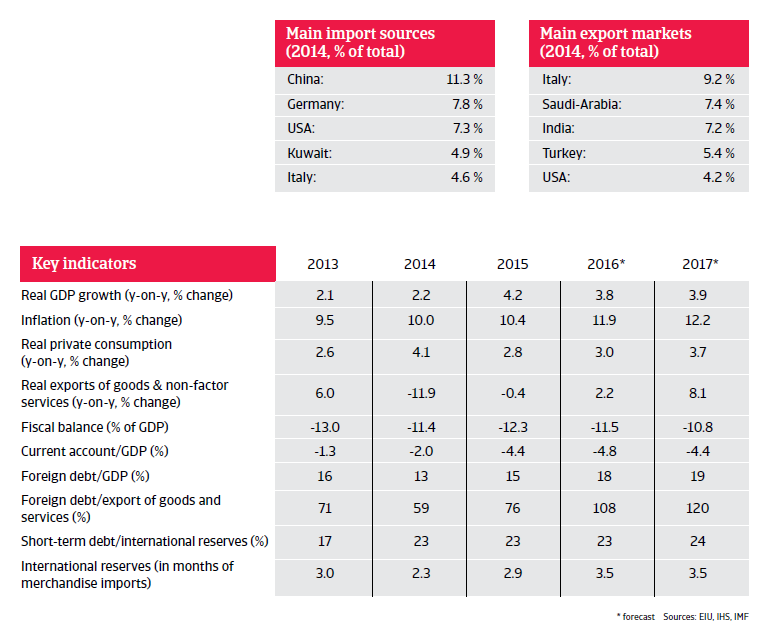 In the medium term, Egypt´s economic outlook seems to be more positive due to the discovery of large offshore gas fields. Increasing domestic gas production should improve the electricity supply and support the economic activity in coming years. In the UAE, payment delays and protracted defaults have increased since Q4 of 2015, as have run-away cases due to cash problems in this industry.